I have a K10D camera for sale. I bought the camera in 2006, and it is in good condition. No scratches or marks of any significance and everything works fine. There is some light dust inside of the LCD screen which you can see in bright daylight or if a light is shining directly at it, but it has never interfered with my view of the screen when it is on. The shutter count is around 11,000. I don't have the box, but in addition to the body I have 2 batteries, the charger, camera strap and video-out cord, which is basically everything it came with. 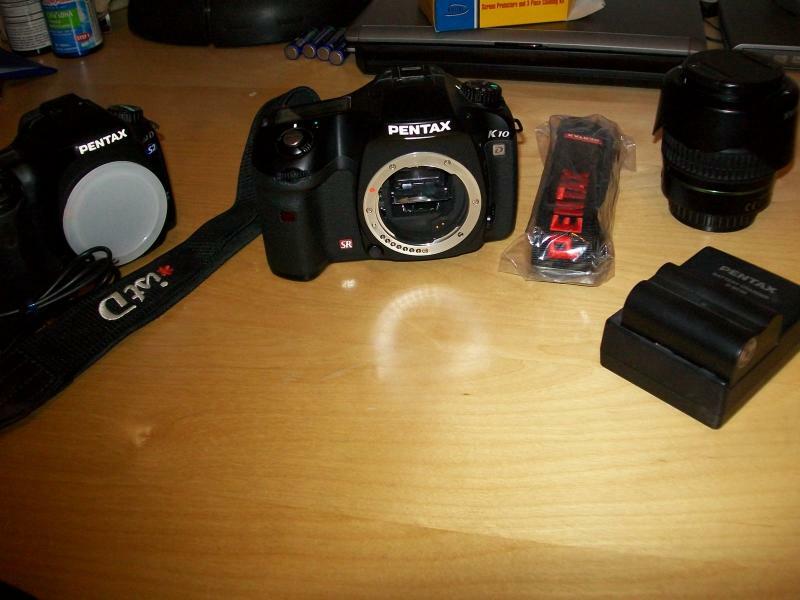 I have a Pentax software CD if you want that as well. The firmware is upgraded to v1.30. I haven't noticed any burnt pixels or anything like that, but let me know if you want a shot of the dark in order to check for yourself. I also have an *ist DS 2 which I will throw in with the K10. The camera operates perfectly, but the LCD screen is busted. It might be a good thing to carry around as a last resort camera, since it is light and takes AAs. Or you can use it for parts, or fool around with it and practice shooting "blind". The shutter count on this camera is around 5700. In the link below, the photo of the back of the *ist is with the LCD screen on so you have an idea of what the damage looks like. I purchased the 18-55 AL kit lens with the *ist DS 2, so I will throw that in as well. I have used it quite a bit, but its still in good shape. I put up $10 for shipping as a guess-timate -- via USPS in the continental US it shouldn't be any more than that. If you want it sent some other way just let me know. The posted picture is just an overview, so please check out this link if you want more detailed images. PM sent for the DS2. PM also sent for DS2. Those are the best "throw-ins" I've ever seen! thanks for the pms - i replied to them all. hi all, Ive got a sale pending on the whole package. Ill update this when I know more. Thanks.